Food Processor Juicer: Do You Get What You Pay For? Home » Best Juicers » Food Processor Juicer: Do You Get What You Pay For? Why buy a food processor juicer? If you are interested in juicing, you purchase a juicer. If you want to prep for meals quickly with a single machine, you purchase a food processor. When you are interested in prepping for meals and have a passion for juicing, you may consider saving expenses and counter space by purchasing a food processor/juicer that does it all. This makes a lot of sense, but you have to make sure that the food processor juicer you purchase is durable enough to handle regular use of all functions. Once you start looking around you will find some dirt cheap models that are very compact and then some more expensive models that take a bit more space. What will you be doing most with the machine? How much counter space can you reasonably give up? How long do you expect your food processor/juicer to last? Once you have a general idea of y our answers to those questions, consider a quick overview of two great food processor juicers on the market right now. One is extremely cheap and compact while the other is affordable but higher priced. Which sounds like the better fit to your needs? The machine has 350 watts of power and a blending capacity of just over 21 ounces. It is compact and easy to clean up, so it doesn’t hurt to have it waiting in the corner or under the sink somewhere. Before you decide that something like this is just what you need, at least read about the next food processor juicer below. You will see what you get if you can afford to invest a bit more in this appliance. 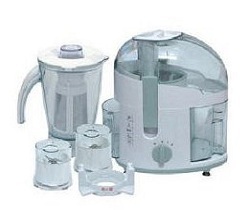 The price tag is more substantial on this food processor juicer and so is the body. Designed from stainless steel with black accents, this juicer is still more compact than many other electric juicers. It might take up a bit more space than the Handy Gourmet, but it is reasonably sized. This machine can do everything the Handy Gourmet can do, but it also allows you to make fresh pasta. It an also be used as a homogenizer. The biggest difference is in the quality of juicing that can be accomplished. 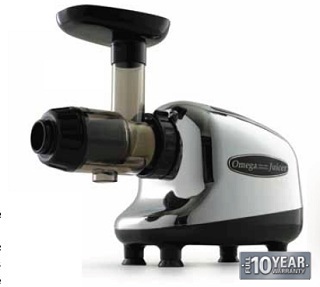 This juicer will process juice at a slower speed, which allows you to keep more of the nutrients and enzymes in the juice. It is very efficient at extracting juice and spitting out dry pulp without clogging up or creating a lot of foam in the juice. Click here to read a complete review of the Omega 8005. Once you get in touch with what your needs and expectations are, it should be fairly easy to determine which of these juicers would fit your kitchen best. 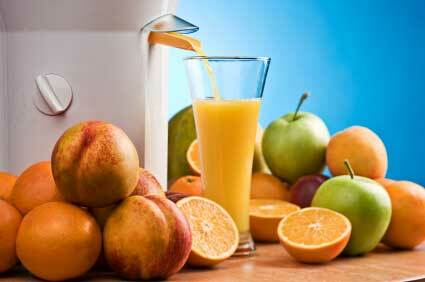 If you need the food processing more than the juicing, then you might not need to invest in the more expensive model. If juicing is your main concern, then a more substantial investment will pay off in the end.